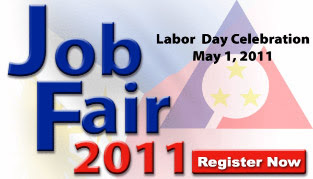 In celebration of Labor Day on May 1, 2011, the Department of Labor and Employment is spearheading a nationwide job and livelihood fair in Metro Manila and 15 other regions of the country. I blogged about this Labor day 2011 job fair previously but that time venues were still unannounced. Thankfully, the venues for the nationwide job fair has been released. The main job fair will be held at the Rizal Park in Manila wherein 50 licensed private overseas recruiters will offer overseas jobs to Filipinos, joining 150 other employers. DOLE's 16 regional offices will also conduct job and livelihood fairs that will provide many more opportunities to graduates and jobseekers at the following venues. DOLE and participating employers are looking to provide 30,000 job opportunities during this nationwide job fair on Labor Day 2011 celebration. * List of SM Supermalls participating in the job fair seen from Manila Bulletin dated April 17, 2011 Classified Ads D Section. Hopefully a lot of our kababayans will be benefited of the job. Thinking about the employment status of the Philippines is so alarming. Great that DOLE is initiating events such like the job fair. I think it will really help the people and could at least minimize unemployment in the Philippines.